Craving for huge customer base for your existing products? E-Commerce gives you possibilities beyond imagination. 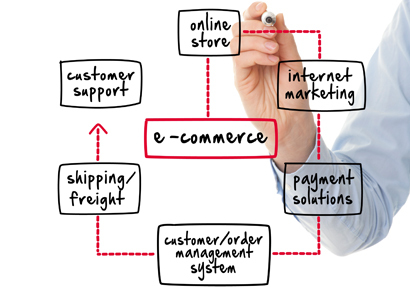 Electronic commerce draws on technologies such as mobile commerce, electronic funds transfer, supply chain management, Internet marketing, online transaction processing, electronic data interchange (EDI), inventory management systems, and automated data collection systems that provides for enhanced shopping experience to the end customer and control of all business processes right under your thumb. Design and user experience can make or break an E-Commerce site - to turn site visitors into shoppers and repeat customers, they need to feel at home on your site. Drupal E-commerce help you seamlessly arrange your services right from user experience till the payment gateway integration. Drupal is still an extremely popular choice worldwide, largely because of its large community and vast array of extensions. It has strengths in areas where the other contenders are lacking, primarily due to its primary function being as a CMS rather than an E-Commerce system alone. One of the most tangible positives of E-Commerce is the lowered cost. A part of these lowered costs could be passed on to customers in the form of discounted prices. Organic search engine traffic, pay-per-click, and social media traffic are some of the advertising channels that can be cost-effective. The automation of checkout, billing, payments, inventory management, and other operational processes, lowers the number of employees required to run an ecommerce setup. This one is a no-brainer. An ecommerce merchant does not need a prominent physical location. Create markets for niche products and remain open 24/7!